It’s time to be calm, but you know that already. The market has had a crazy week, filled with ups and downs flowing at a quick enough pace to ensure – if you were going into a meeting to discuss market forecasts – you really couldn’t write up an actionable plan. You could have just as easily relied on an iPhone and a Magic 8 Ball. Analysts don’t like that kind of uncertainty, so if you feel like the advice you’re getting on TV is aimed at making you panic, you’re probably right. 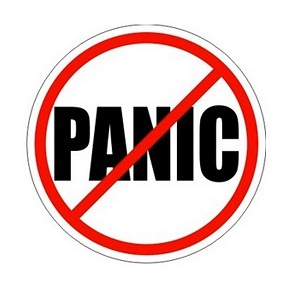 However, don’t let other people’s panic make you panic. In fact, when everyone else is panicking, it’s the calm person who can actually get something done. But the markets will open tomorrow and something could happen. Who knows? And if that something does happen, how do you keep from entering into a panic mode? How can you resist the urge to pull all your money out of savings or rethink your entire retirement? We’re going to explain why staying calm is the most important thing you can do, but let’s first play a game. It’s really quick and it simulates the market using actual history. The Fed knows what it’s doing. The new administration at the Fed has kept interest rates low, and many analysts have been expecting a rate hike throughout 2015, with some of them even predicting two increases. A rate hike would be bad news for Wall Street, and the same market prognosticators who claim the sky is falling are pointing to an impending rate hike as “Exhibit A” that your retirement is doomed. First of all, there’s no guarantee that a rate hike is coming. Even if the Fed raises the prime interest rate, it may be good for your stocks, because uncertainty over interest rates is part of the reason the market has taken a hit. A rate hike, particularly a modest one, could calm fears about the uncertainty of interest rates in the future. A rate hike also helps your savings. Every dollar in your savings accounts – from money markets to IRAs – will get stronger when there is a higher prime interest rate. So, if you’re convinced interest rates are going to take a bite out of your investments, your best move is to simply decrease the portion of your portfolio in stocks and put more of it into various savings products at CORE. We’ve always had very competitive dividend rates on our savings accounts. If the Fed raises interest rates, that usually means good news for savers. China’s problems won’t hurt us. While their currency is in crisis, and that has spilled over into other market sectors, it’s premature to panic over market instability at the world’s largest manufacturer. The economic interconnection between the US and China, the world’s two largest economies, is not the kind that allowed the 2008 financial crisis to spread so quickly. In fact, it’s the kind that prevents that type of spillover. In general, they manufacture goods and we market/buy them. The stronger our currency is relative to other countries, the cheaper we can find consumer products. For example, if Walmart were an independent nation, it would be China’s fourth largest trading partner. Our largest brick-and-mortar retailer stands to profit, as do their customers. In other words, if you leave your retirement funds in your savings and trust your credit union to take care of you, you can probably find everything you were going to buy for less, so you don’t need as much cash to live on while you wait for the market to recover. You can spend less without making sacrifices. The other benefit to the US economy stemming from China’s hiccup is that it likely means durable goods will sell well. Families that have “made do” with a lukewarm refrigerator or the world’s slowest dishwasher can find replacement appliances at more affordable prices. To put it in simpler terms: You’re finally going to replace that stove you hate, and so will your neighbors. You’ll save money on it, and the American businesses that design and sell that stove are going to enjoy the profits. Those companies will turn the profits into increased manufacturing, which will help stabilize the Chinese economy. The durable goods sector is going to help buoy the stock market, which will help the overall economy in the process. If you want to take advantage of this temporary window, talk to us about a home improvement loan. You can apply here. Remember, if you want to make these kinds of household investments or take advantage of cheaper prices on the parts and supplies that go into other home improvement projects like patios and even driveways, lock in a fixed-rate loan now, before the Fed hikes interest rates. You can find our home equity products here. In the end, market forces are driven by consumer confidence, and your household economy is no different. Think back to that game you just played. Waiting out temporary market downturns or moving your money to safe savings programs are the only way to consistently grow your money in the long-term. Put your money with someone you trust, take a deep breath, and stay calm.